A Tesla For The Masses? 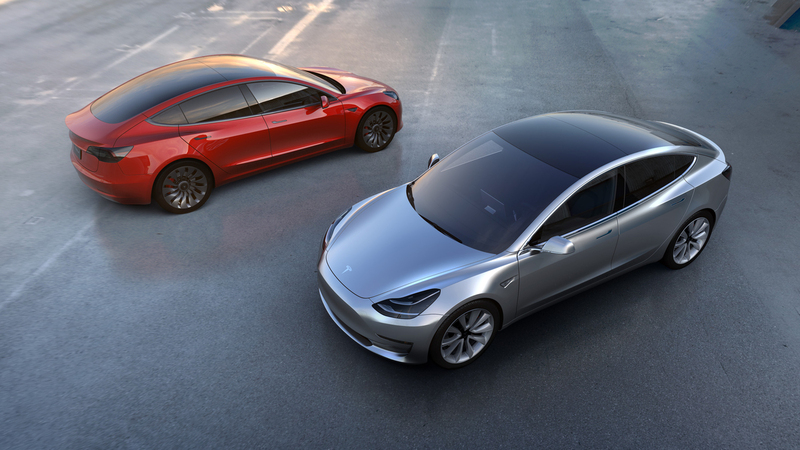 Orders For Model 3 Top 100K In First Hours : The Two-Way Before the Model 3 was even unveiled, people lined up at Tesla stores to put down a deposit. With a base price of $35,000, the car will go on sale late next year at the earliest. 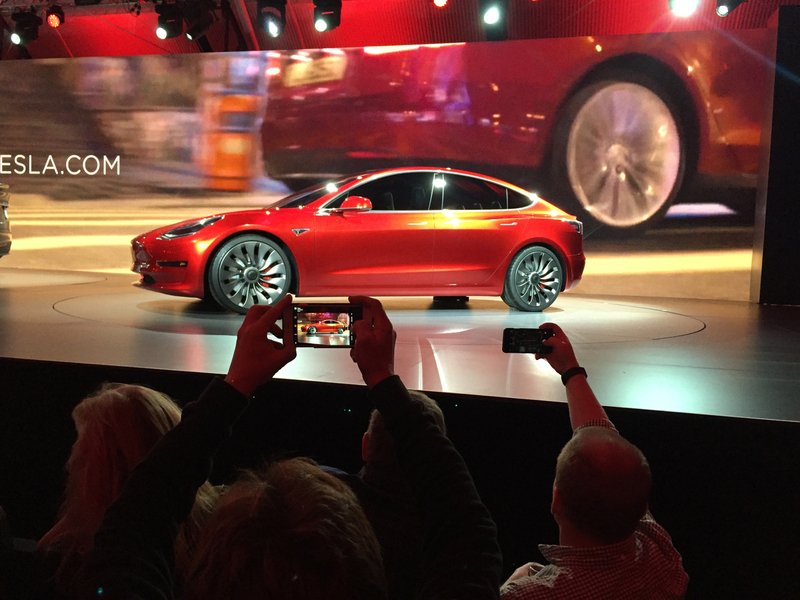 Tesla, the maker of electric vehicles, Thursday night unveiled its mass-market Model 3. The car is expected to have a range of 215 miles at a base price of $35,000 ($27,500 after federal tax credits). Tesla CEO Elon Musk told a crowd of loyal fans in Hawthorne, Calif., he is "fairly confident" the vehicle will go on sale in 2017. That the assembled crowd laughed at the statement is a sign of the near-cult following Tesla (and Musk) enjoy. By 10 p.m. PDT, the company had received 140,000 advance orders, according to Musk, for a car almost no one had seen. The Model 3 has "fast charging" capability, a trunk in the front and the rear and a sheet-glass roof. 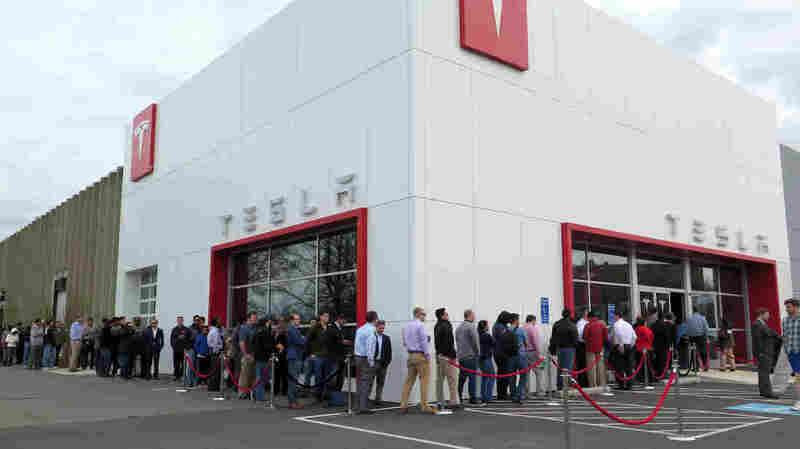 "I've never read, seen or heard of an event where people are waiting for a car they haven't seen," said Barbara Heron, as she waited in line earlier Thursday outside a D.C.- area Tesla store. She was placing a down payment on the car for her husband. The Model 3 is meant to be the company's first attempt at a people's car. The vehicle looks like what it's intended to be, the JV to the Model S' Varsity. Instead of instrument panels and nobs, the vehicle has one big, 15-inch flat screen that serves as its central command. The Model 3 has "fast charging" capability, and with two trunks (one in front and one in the rear) and a sheet-glass roof, it's distinguished from other electric cars and most other vehicles as well. The unveiling was meant for Tesla true believers like Mark and Judy Vernoy. They drove their Model S to the LA area from San Diego County. The Vernoys, a retired teacher and retired professor, have a Ford F-150 pickup truck and a Tesla. "We love our Model S so much," says Judy Vernoy, "that if this is anything almost as good as that, it's worth the risk." The Vernoys, like others, feel their down payment is getting more than the promise of a car — it's also an investment in Tesla. "Usually we buy a car and we keep it," says Mark Vernoy. "And we keep it for 20 or 30 years. We don't turn them in every year, and so it's important for us for Tesla to be successful." Customers lined up at a Tesla store on Thursday to put in down payments for the new Tesla Model 3 in the Washington, D.C., suburb of Tysons Corner, Va. The key question for Tesla Motors is not how cool the Model 3 may be, but when and if the company can begin to make a profit. For Tesla and Musk to be successful, industry insiders and Musk himself say that the Model 3 is crucial. Jack Nerad with Kelley Blue Book says what was announced at the unveiling is as important as what wasn't. For instance, he points to the low pre-tax-credit sticker price of $35,000, which Nerad calls eye-poppingly low. "Tesla has a history of introducing a vehicle with a reasonably low price and then selling versions that are much more expensive," says Nerad. Many of Tesla's challenges may not be car-related. With gas prices still low, electric and other alternative vehicles have seen sales fall. Meanwhile, those federal tax-credit incentives begin to phase out after sales of a manufacturer's electric vehicles reach 200,000 in the U.S.
And then there is the competition. In January, General Motors announced its own electric people's car, the Chevrolet Bolt EV, which is expected to have about the same range and price as the Tesla Model 3. The Chevy goes on sale in the final quarter of this year. The car business is a tough one. Only three of the legacy carmakers in the U.S. are still in business. Many more manufacturers have come and gone. With its high stock price and $30 billion market cap, the pressure is on for Tesla to show a profit. Rebecca Lindland, also with Kelley Blue Book, like many in the industry views Tesla with a mix of excitement and skepticism. "Oh, my goodness, the car looks gorgeous. It looks like a million bucks," she says — adding, "Hope they can deliver it!" A view likely shared by consumers, Wall Street and Elon Musk himself. A previous version of this post stated that federal tax-credit incentives end once total industry sales of electric vehicles reach 200,000. In fact, the credit begins to phase out after a manufacturer sells 200,000 qualifying vehicles in the U.S.